I just finished a Food Blog just last weekend about Juicing and Blending. I have to rewrite what I have discovered since that blog. I talked about the juicers I have bought and how I liked or disliked. I have a centrifugal juicer. All the juicers that I bought reticently was a common market Centrifugal juicer. My very first juicer I had almost 20 years ago was a Juiceman Jr. and I really enjoyed that juicer. I got it as a gift and it was only $10.00, but I had to clear space in my old apartment. So I gave it to Goodwill. Whoever bought it in LA probably paid more than what the gift was at that time. Anyway the next juicer I bought was called Bella. It is from a company in Canada. This company sells a centrifugal and a slow juicer. I heard equally good and bad from reviews about this juicer. I bought it from Target for $60.00. I gave it a try once, and packed it back in the box and took it back to Target. When you juice you want to see juice, not drips of juice. I juiced 1 apple and received less than a tablespoon of juice. It only had one or two speeds. So I know I could not have juiced wrong. For hard fruits or vegetables you want more power so I know I had max power. Then I tried to juice celery. Now celery is nothing but water. I did receive more liquid but was not impressed. By the time I got finished juicing 4 carrots, 3 celery stalks, 4 apples. I had 2/3 cups of juice and ¼ cup of foam. I was so disappointed. I went immediately to the net and searched again for a juicer I could buy immediately and not have to ordered. I noticed Hamilton Beach Big Mouth. Walmart had two version the Big Mouth and the Big Mouth Pro. The Pro was $10.00 more. I thought you would get an upgraded juicer. Walmart had a lot of The Basic Big Mouth and 2 beat up box Big Mouth Pro. I wanted the black so it would not show stains and it seems more powerful. Oh I did mention the Pro was the Black model so I bought that. Guess what they Basic Big Mouth and Pro models are the same even though the Basic model was colored white and the boxed were much neater, it advertised 800 rpms and the Pro was advertised 1000 watts. So I thought I was getting a faster model. AD ALERT! IT IS THE SAME. The only difference of the two was that the Pro came with a small cup for the juice and a brush. Well the juicer was not bad. I paid $49.99 for this juicer and it did advertise that you do get more juice than some of the expensive models. But one thing I did not like was the forth. On the reviews of this machine was pretty fair. It did have a lot of good remarks. You did get more juice for your buck but the motor did run very load, and a lot of people stated they could not juice in the morning since it sounded like a 747. And juice did get a good amount of froth. I did not see a hug problem. I was not trying to spend a lot of money so I was satisfied, until I had to return a coffee pot back to Sears and I came across a juicer that I wanted but Could not find. This juicer had almost the same bells and whistles like a juicer called the Breville fountain but was almost ½ the price less. This juicer had 5 speed, and used 1000 watt power like the Hamilton Beach but was more quiet and had a froth controller. What? Wait a minute, a froth controller. That sold me. So you know what happened, I whizzed home looked hopeless for my Walmart receipt for my likeable Hamilton Beach Big Mouth Pro until I found it and went back to Walmart returned the Hamilton Beach BMP and went to Sears with a $25.00 off coupon for any small appliance of $150.00. I bought my juicer. The brand and model was a Cuisinart Juicer Extractor CJE1000. The reason I did not get a Breville is the all the hype I have read on reviews and looked on You Tube exhausted me. I mean people only bought the juicer because of a documentary on Netflix called "Fat, Sick And Nearly Dead". From what I read a young man was very sick and over weight and was taking a lot of medication and he decided to change the way he ate. He started juicing to stay alive and became healthy and lost weight and stopped taking his medication. So after that documentary the juicing craze began. Well I did not know anything about man's story until after I bought the Hamilton Beach BMP. So I do not fall into that category of why I wanted only a Breville. It may be a great juicer but some folks in the WWW world stated the price jacked up after the documentary went virile. Also I viewed both pro and cons on both juicers. Depending if you ate getting the 5 speed Breville the price is about $200 or more, and it has about the same features as the Cuisinart CJE1000 but I think it is a 800 or 900 watt. 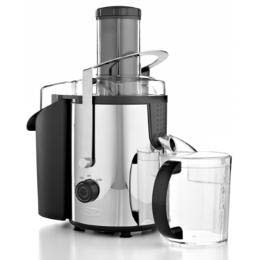 The Breville juicer that has only two speeds but is about the same price as the Cuisinart CJE1000. People stated on some of the views that the Cuisinart CJE1000 had wet pulp. I did not experience that. unless you have a juice food like beets, watermelon, or berries the pulp was dry to my touch. You will never get a stone dry pulp from any Centrifugal juicer. The Hamilton Beach had wet pulp. I even juiced the pulp and juiced a couple of tablespoon of left over pulp when I had that juicer. I had the Cuisinart CJE1000 for almost 4 days and see not problems. Even the froth is less than the Hamilton Beach. This is what I have to say about all of the juicers and not just the ones I returned to the store. If you want the ultimate juicer than you should have no problem shelling out the ultimate dollars. But why fuss if you are not or can not afford the best model. You have to research, shop and may have to return and shop again to get a good juicer that is right for you. All juicer are a pain to clean. Some juicers are loud as heck, some juicers will not have a brush or have the power you crave, But if trying to compare for example a citrus juicer to a cheap Centrifugal juicer you can not do it. The function of that two is different and you will not have the same result. I am fugal I want more money for the bang. I tried the cheap juicer which worked better than a mid price juice. It did make more juice but was load and made a lot more froth, I settled for a mid -high juicer from a well known company that had similar gadgets as a Breville but was not over priced or over advertised. It may not be the best but it surely not the worst. I have been surprised and over joyed from the times I have used it. So the Cuisinart I will say I give it a 10. I believe some folks may either over exaggerate or they juice to fast and uses the wrong setting. In a centrifugal it is almost not worth will juicing green leafy vegetables. but I have done it by using a low speed of 2 and freezing my fresh greens for 20-30 minutes before juicing. A representative from Bella gave me that tip. So all in all I am sticking with the Cuisinart CJE1000. Since buying my Ninja blender early this summer I have been very satisfied. For one thing I snack less at work. When one of my coworkers or doctors brings a sinfully delicious cake, cookies or even the carb laden bagel to work I do not march in to help myself. I drink my blended protein smoothie throughout the morning and feel full. I do in mid-morning need to eat a snack but even then I still will be drinking my smoothie. My snack is usually consist of a protein and a whole grain product like 1 slice of whole wheat bread toast no butter, or my protein bar or my now black bean brownie. I have my cake literally and eating it to. And yes I did say Black Bean brownie. It is decadent dense and totally satisfying. You have your antioxidants from the chocolate, and your protein and fiber from your black bean and eggs. You cannot even taste the black bean. I got the recipe off the info tele at work called Accent Health. I have two ways of making the brownie. If you want it like a cake brownie and if you like it as a dense fudge like brownie; they both made the same way it just the way you blend the ingredients which will make the difference. I have the recipe I call them my Diablo Brownies check it out. Amazing New Juicing Software Instantly Cranks Out Healthy Juice Recipes From The Ingredients You Already Have In Your Kitchen So You Can Increase Energy, Add Antioxidant And Anticancer Fighting Agents To Your Diet, And Aid In Losing Weight. Any way I love the way I have changed making my breakfast and lunch for work. The only problems I do have is when I make my drinks the day before. I do not have time to bother making my drinks the moment I am about to consume, so I know I may be losing some nutrients but it is not ideal to gather what you are going to put in the drink and the noise will wake up the whole neighborhood in the morning. So making my drinks the evening before going to work is the only way I go. I am a type of person who love eating vegetables. I can eat salads every day. But though eating the green stuff and getting the nutrients from them takes a lot of work from your body to break them down, so blending and or juicing is the way to go. 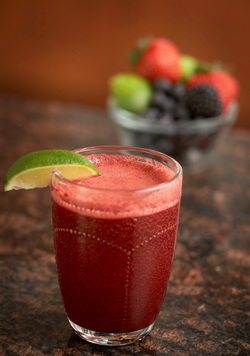 Juicing is good if you want to get the nutrients that that the veggie will provide for you immediately. So when juicing you are not getting the fiber that helps cleanse your digestive system. And for those people who have problems digesting certain fibrous vegetables and fruit, juicing is best for them or taking a supplement. But for people who can and need to have fiber in their diet, I would suggest blending and juicing. V-8 juice is one of those products that is good and bad for. It is good because it does link if you cannot eat the recommended daily fruits and vegetable into your diet it is best to drink them. And it is bad for one thing, it is not fresh and it has a load of salt an additives. And the V-8 fruit fusion has the sugar. But it is good when you forgot to juice, or do not have time to juice. Just remember to get the low sodium non added sugar V-8. I watch a lot of You Tube. It has a lot of good informational stuff and that is no BS. When I was looking for a good blender that when I took notice of my Ninja. It had a lot of good comments and a lot of bad comments. I was looking for an economical blender that could make my whole veggie and fruit drinks and a blender that I could use to grind up my nuts for my protein bars. And hands down the Ninja won me over. For one thing the price was great. If my Ninja breaks down in 6 months and I have had it now for about 3 months, I will have gotten my monies worth. The next blender will be a Hercules. It is as powerful as the Vitamix but 2 times less expensive, and it has a 2 tier serrated blades. I am working my way up to the Vitamix because it is American made, the warranty is unbelievable, and it is a Great Product. But it is expensive. One thing to keep in mind when blending your juice you do need to add water or you will have glue or not an easy drinkable liquid. Adding a little water is not bad and it help break down the fibrous vegetable plant. Also blending or juicing vegetable is best when vegetables are slightly frozen, especially green vegetables like broccoli, Kale and green beans. It is best to have a high RPM blender like the Vitamix, Ninja 1500, or the Hercules blender, but a good blender like the Nutri Bullet and the Ninja Professional 1100 works as well. I do find I have to blend the hard to break down vegetables like carrots and Kale with water before adding any other ingredients. The longer you blend with water or your own homemade juice the better. Well juicing was the first way I was first introduced to doing when I was a child. It was fun but I hated to clean the juicer. I had received one when I was in my 20’s the Juiceman Jr. And I loved the juicer. It was very inexpensive and made a lot of juice. I had it for almost 10 years before I got rid of it. I was trying to downsize stuff I did not need at the time and my Juiceman Jr had to go. I wish now I did not depart form it, since now I had to buy another one. I shop on the net for new gadgets and it I got to have now I go to the store instead of buying ot online. Though, when you buy stuff on line you can get great discounts. Anyway I came upon a blender called the Bella. I read the reviews and also looked on You Tube to see if it was a good buy. Well at first I thought it was. When I first used it I did not juice much juice. It just ate up the fruit that should had yield a good amount of juice; like apples and celery. I had drops of juice; which was very disappointing. I bought the Centrifugal juicer at Target. A centrifugal does not compress or smashed the fruits or vegetables into juice like a cold press or a slow juicer. It grates and chops the fruit and vegetables to small pieces and through the left over pulp or waste into a solid ben and the juice is whirled around and separated through a metal fine sieve and comes out of a spout were the juice is collected in a glass or pitcher. A Centrifugal juicer is more economical, less expensive and faster than a slow juicer but the worst thing of this juicer is it does waste a lot of the pulp. Most of the pulp can be wet. Which some folks on You Tube will rejoice the pulp. I found that it takes too much time to recollect the pulp and rejoice. What I do is collect the pulp and place it in a freezer bag and freeze the pulp which is the fiber of the fruit and vegetable left after juicing. You can use the pulp for baking or for soups or use it to make you smoothies. Keep in mind use more liquid than pulp for it will make you smoothie very, very thick and goopy. Some folks on You Tube would breakdown the pulp in a blender and freeze the pulp in using an ice tray. Well after I took the Bella back I bought the Hamilton Big Mouth Juicer. 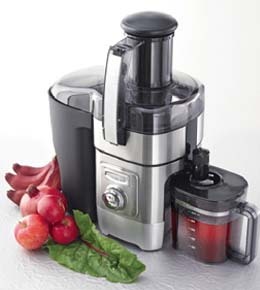 Buy the juicer without the cup, it is the same model as the Hamilton Pro Big Mouth but it is over $10.00 less. Trust me. I should have bought the Regular Big Mouth and not the Pro. I bought mine at Walmart. This juicer is good for beginner, but it is load and does produce wet pulp. But you do get a whole lot more juice then some expensive centrifugal models. My next juicer when I can afford will be either a Breville model cost about $120-200 for a great one or if I buy a slow juicer I would rather spend a $500 on a good model. What society say is true, you get what you pay for. Anyone need a discount on items you want or need? I came across this coupon website that may help find great deals on products that you may want or need. I have mention my Ninja blender several times on the blogs, and it is true. I l.o.v.e my Ninja. I use it every day. I make my breakfast and lunch protein drinks and I chop my nuts and seeds for my protein bars. I have a Ninja Professional 1100. It comes with two single serve cups. I wish I could afford the Vitamix blender because it has metal gears on the base of the blender, which would last longer than the Ninja. The Ninja Blender is all hard plastic, but it is powerful and you do get your monies worth. I would like to get the Ninja Mega1500 model for it will break up the fibers of the fruits and vegetable way better than the 1100. The price of the 1500 watt is around $185.00. But all in all my drinks are still great with the Ninja Professional 1100 model. The this blender it is affordable for almost everyone. I have no problem chopping up nuts and seeds. I can grind them medium fine or course. I have made my spice blend using the Ninja and a small coffee grinder. I use the coffee to my a powder from the spices since spices are hard fiberous seeds. The coffee grinder has a hard time breaking down the spices but the Ninja has a hard time making the spice into a powder but can break down the seeds to a course mixture. I mixed cardamon (a hard spice), black pepper, fenugreek, cumin seeds, mustard seeds, and cinnamon sticks. I have also chopped almonds, walnuts, pecans, chia seeds, flax seeds and oatmeal, wheat berries and unsweetened coconuts flacks to make my protein bars. The blades are stacked in tiers of 3. So it pulls the food down when chopping and blending. One thing you need to do if you are blending fibrous vegetables like carrots or kale you need to add water. It helps break down the fibers and makes them much smoother but not completely juiced. But you get all the nutrients from the whole fruit and vegetable. I bought my blender at Target for $150.00. But if I researched a little harder I could have gotten my blender cheaper in price, that shucks. I was at work when I heard Dr, Oz on the television. Now I do not like his show but sometime he does have a topic that interests me. He was asking a lady what she finds the hardest to lose fat from her body. And she stated it was her stomach. She stated she tried exercising, changing her diet, etc. she just could not lose the gut. So he gave he a test to see what type of fat her body had? He told her to hold in her gut and poke her finger into her abdomens to see how far it would go in; and so she did. He asked her how far her finger went. She answered, not far at all. Then Dr. Oz stated people who have fat that jiggles and your finger can easy push into the abdomen the fat is easier to get rid of. But for those who have fat the is hard and your finger has to be forced into the abdomen you have fat that is hard to lose. It is called omentum. It is found behind the abdomen muscle. Folks call it the beer belly fat. For one thing I do not drink beer. I do not consume on a daily bases of processed foods. I do eat complex carbohydrates. And I get more than the daily allowances of vegetables and some fruits. But I have always had trouble losing weight. Any way Dr. OZ stated on one of his shows that if you eat certain spices it helps burns or what he stated melts the under muscle belly. And he stated one needs to avoid of course; white sugar, processed foods, simple sugars like white rice, white flour pasta, even processed 100% wheat bread. I may make my own wheat bread. Well I can do almost everything except the rice. My family is not very fond of it. It is a bothersome to make. And since I will be the only one eating it, it may go bad. I do not eat rice everyday. I have a list of some of what Dr. OZ stated what spices are great to help lose belly fat, but I found some extras off of neighboring websites. I make a spice blend and uses in my cooking and desserts. I have a savory and a sweet spice blend. 2. Cayenne Pepper- Has a substance called Capsaicin it what give peppers its heat. Consider this spice a thermogenic substance. Since this spice makes you mouth and your body feels hot it is said to help burn fuel and help speed your metabolism by 5 percent. It is supposed to help make you feel full and shrink fat cells. And also cayenne is supposed to help utilize proteins within the body. 3. Black Pepper- Has a substance called piperine which gives the pepper its intense flavor. When added with other spices that had Capsaicin it burns as many calories as if you took a 20 minute walk. 4. Turmeric- has a substance called Curcumin that lessens the formation of fat tissue by affecting the blood vessels needed to form it. Curcumin may also help stabilize insulin resistance, hyperglycemia and other chronic disorders. 5. Ginger- Has anti-inflammatory properties and may have themogenic properties to boost metabolism and help burn fat. It is also an appetite-suppressant. 6. Mustard- Is a Cruciferous plant; related to broccoli, cabbage and Brussels sprouts which you can called Super food. These type of Super plants contain lots of antoxidants, vitamins and minerals, and fiber that everyone bodies will benefit form. 7. Cardamom- can be used as a savory or a sweet spice. Cardamom and other spices like cumin, and fenugreek are in many dishes from India. It also has themogenic properties that helps boost metabolism and energy and can be great for people with diabetes. It is also is used as a medicinal and can also help with memory and stress. 8. Cinnamon-may help to boost metabolism, but it is an ideal spice to reduce and stabilize blood sugar levels. I found information on much of these spices on the internet form a physician; Dr. Dr. Mercola stated “Cinnamon has been found to significantly reduce blood sugar levels, triglycerides, LDL (bad) cholesterol, and total cholesterol levels in people with type 2 diabetes”. This is one super spice for Pre-diabetics and Diabetics in general. I make up my own spice blend. But for the peppers and any spices that has an pungent taste use caution or you will be flying out of your house because the spice dust will attack your nose senses and may water or burn your eyes. The savory spices like mustard, pepper, cumin are good for dry rubs for meats, sauces, soups and stews even on a good potato or sweet potato is good. I like to make a spice butter and add a little of the spice butter to fish cooked in parchment paper with lemon juice. It is incredible. The sweet spice like cinnamon, ginger and cardamom are great for all your baking goods, such as sweet potato or pumpkin pie, apple pie, spice cake, apple cake, ginger cookies. I made sweet spice combo to put in my homemade berry drinks in the morning. Also you can add them into your coffee or tea. One thing buy the whole spice at a good Indian or Middle Eastern store. It will save you time and money shopping for spices. These stores have a rainbow of colors and flavors. Some spices are already combined into a mix for you. Also make sure you have a grinder specifically for grinding spices. Like I stated earlier much of the spices has a pungent perfume and may interfere with other foods you may use. Buy a different grinder for your coffee beans. I have a Ninja. And you will hear a lot of how I love, love my Ninja Blender. I have the Ninja Profession with the single serve cup. The power of this blender is 1100 watts and it pulverizes the spices to fine granules almost dust. Here is a simple recipe that combines almost all the spices. I call it “My Spice Blend”. I have posted on Face book homemade protein powder recipes for I cannot afford to buy containers of protein powder that are loaded with added sugar and other stuff that is not good for my blood level as a Type 1 Diabetic. One recipe I did find on the net had simple ingredients; dried lentils or pea beans. oatmeal and brown rice. Okay, that was not for me. For one thing I make my shakes ahead of time to take for work and I know all those ingredients will absorb the liquid and swell. I do not want to drink cereal for a shake. But I guess you could stir the protein powder before drinking. Then I thought well what about unflavored gelatin. It has good health properties and it has also 7 grams of protein in each packet. Yell I know a lot of people are turning up their noses on this, especially if you are vegetarian, vegan or who do not consume pork. I have other proteins for yall that has no animal bi-product in it. But all in all this protein is relatively inexpensive you can take it on the go. You may want to dissolve it in a little warm water but the benefits are there. Gelatin in good for your hair nails bones and joints, it can help with digestive problems, and like I stated it has 7 grams of protein in one packet. I could combine soy flour and the gelatin together and have the ultimate protein. But the cost of the two items would be about $10.00 which is good but then again one might just go and buy original protein powder, even though it would have ingredients that anyone can read and understand. The soy flour would give you up to 6 grams of protein. So to take in account you would have at least 13 grams of protein. But then it hit me yesterday on Memorial Day, I have yogurt and cottage cheese in my refrigerator. I use the yogurt for my protein drinks. Why not replace it with cottage cheese it has more protein and no sugar. And it makes my shake thick without added ice. I get about 11grams of protein from the cottage cheese. And if you are a non meat eater or cannot tolerate milk use medium firm tofu or even blend frozen shelled edamame beans. These beans are young soy beans that are not processed and are green. Why buy protein powder when you can use protein that you may already have in your refrigerator. 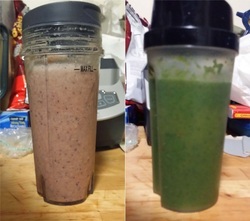 Here are two protein drinks that I drink in for breakfast and lunch. It is the same recipes but the lunch one has vegetables added. I have a Ninja Blender with a personal single 16 ounce serving cup that will whole all of the ingredients. But a good blender should work if it can chopped fibrous foods like vegetables. 2 heaping tablespoon of cottage cheese, or medium firm tofu, or ½ cup of frozen endmane beans. Place water in first and then the fruit, then blend. After everything has been blended add the honey and the cottage cheese or tofu and blend until thick and smooth. If too thick add more water if to thin add a few pieces of ice. Poor into 16 ounce serving glass. Use the same fruits except cut down on the berries. For example, instead of 8 blueberries use and 5 strawberries. If your container can hold more use them all. A handful of romaine lettuce (Trust me you will not taste it). 1 celery- You can peel the threads of the celery if you want. Chop celery into bite size pieces. In the blender add the carrots with the water blend until the carrots turns to pulp. The add 3 of the ingredient and blend. When both the fruit and the berries are well incorporated add the vegetables and the cottage cheese and honey. For this one add a little more cold water you do not want a smooth just a a nice drinkable drink. This may make more than a 16 ounce cup. Blend in batch and combined together if you have one of the smaller type drink blenders. Finally I made a Green Machine Drink. I used all the ingredients in the Berry carrots drink but in a lesser amount. I put kale greens, green leaf lettuce and 1/2 an apple green if you have it, but I did not I had only fugi apple. Try these drinks. Salutation my name is Lajuana and welcome to my food blog and Living Happy with Diabetes website. I have been a Type 1 Diabetic for over 35 years and I want to share what my life has been like with Diabetes. I hope you can join and share your stories with me. It would be like a friend support group with informational power.